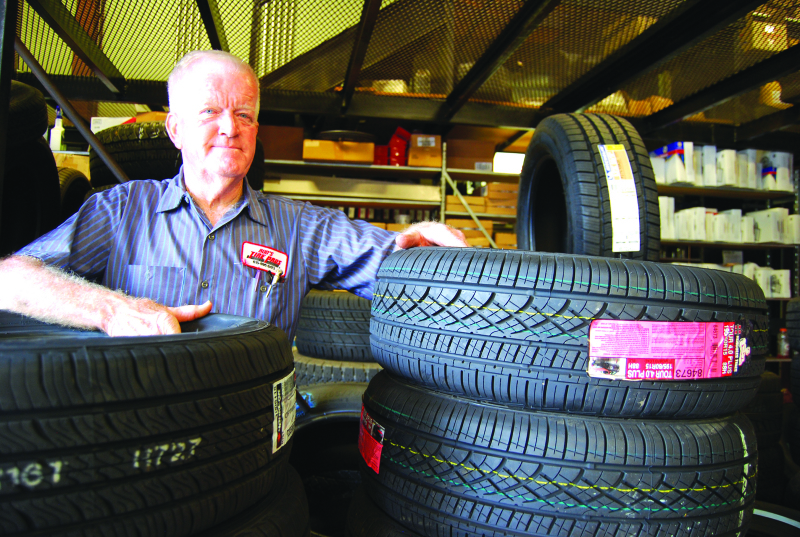 Bud Mitchell of Bud's Tire Pros has done business from nearly the same location on Woodbury Pike since he helped his father run Wilson-Mitchell Store, located directly across the road, when he was a lad in the 1940s. Bud Mitchell, the master mechanic who runs Bud Tire Pros on Woodbury Pike about four miles east of the Murfreesboro square, knows tires better than Colonel Sanders knows chickens. But he's also got a pretty good grasp of what makes folks tick. The college drop-out possesses a doctorate in doing good to his fellow man, a trait he earned as a youth working in his father's grocery store in the 1940s and '50s. "I got to meet people, got to know them. We had an old Warm Morning heater in the store, and in the winter the old men would come in and sit around, and I learned a lot listening to older people, and I got a good education. I met some of the finest people there ever was," says the smiling Mitchell, who has a knack of leaving people with an easy feeling after they spend a few minutes around him. The optimistic businessman was born Glenn Wilson Mitchell in 1941 in a work environment, his father' store in Barfield. Five years later his dad opened a new grocery store, on the site of today's Wilson-Mitchell Hardware. "My granddaddy, A.H. Wilson, ran a store on Franklin Road, and he helped my daddy by loaning him $600 to get his store. That was why he used the name Wilson & Mitchell because my granddaddy had credit," said Bud. "I grew up helping in that store across the road. I never did like school," he says, noting that his mother Alice was a schoolteacher at Kittrell and McFadden Central and his sister Judy became an educator who taught in Fort Worth, Texas. After attending MTSU a year and a half, he decided he had had enough of book learning. "I wanted to work. I helped my daddy from the time I was little till he died in '66. I'd been fired a hundred times if I were working for the other guy. That's the reason I work for myself. Mainly I work for my wife. She's the boss," he says of his Kay, his better half, to whom he will have been married 52 years come Oct. 18. The couple has a son, Andy, and a daughter, Alison Mitchell-Warrick, and three grandsons, Drew and Clay Mitchell and Lincoln Warrick. Drew helps at the front counter of Bud's Tire Pros, while Alison, also a paramedic, serves as Bud's right hand and has just about taken over the operation. "She runs it now," he said. "I let her make a lot of the decisions." Bud's been attending to other people's cars and trucks for decades and remembers the day it started. "My dad put a grease rack in, and from the time I was 12, I changed everybody's oil up and down this road. From '46 to '64 we had an old wood building. I was a meat cutter, and I would stop to go change tires in the basement. "When I was 17, we were drag racing," he said, switching gears. "I put a Chevy engine in a Ford and got started on oval racing. I raced in Smyrna, Nashville and Ridgetop. I really enjoyed doing that. I built the motors. I did it for 15 to 20 years. About racing, people will get mad and want to fight, but I just had a good time," he reminisced of the days when he competed and also rooted for such top NASCAR drivers as Fireball Roberts. "We first went to the Daytona 500 in 1961. I've hardly missed one for years," he said. "Talladega, I've gone to about all of them, and those at Bristol." The former meat cutter, Bi-Rite grocer and mechanic commenced to selling tires in 1987. "I used to build stock cars and stored feed in a building on this side of the road. I came over here and started fooling with tires. It worked real good," said Bud of his tire business. "Had a fire in '06. I didn't know how good people were here until then. I had insurance but not enough to build the building back. People gave me $23,000 to help build the building. I found out I didn't need it. I put the money in a fire fund and give it away to people when they need it for a tragedy like a death and funeral expenses. I call it Bud's Tire Fire Fund. "The fire waked me up to how good people are to us. So nice and patient with us. When the store burned, I was in Texas. I got in the car and hurried back this way. Three days after this place burned, I had this cleaned up, and we went over to the hardware store across the road and used it. We were back here in three months, but everybody helped me. "We do about everything but no motor work. We sell tires, do brake jobs and repair. A lot of Cannon County and Rutherford County are our customers," noted Bud, who has a staff of 10 to 11 employees. "What I enjoy most is meeting people and pleasing people. Trying to give people what they're happy with is what we do. Your satisfaction is our goal. That is truly what I believe. "God puts us here for a purpose. I believe I was born with one talent, but I think I've picked up at least one more," said Bud, an elder for the Science Hill Church of Christ who has served with their Inner City Ministry for more than 20 years. "The big thing about Bud is that he is always interested in other people and trying to find a way to help them. He's a special man," said Truman Jones, radio show host and former Rutherford County sheriff who has been a close friend of Mitchell since elementary school days. "He's one of these people that you can trust 100 percent. When you do business with him, he is more interested in doing something for you rather than trying to make money in the business. He's just like his daddy, Glenn Mitchell, who ran Wilson-Mitchell store. They had a grocery store that took care of everybody on the east side of town and were known for taking care of their customers all the way back then. "Bud used to be a great NASCAR-type racer. He could take anything mechanical, whether it be an engine or whatever, and take it apart and put it back together, even when he was young. He just had that gift," said Jones, who in his younger days bought a souped up '63 Corvette from Mitchell, a car he wishes he still had. On Sept. 28, 2013, Bud narrowly averted death after a horrible motorcycle wreck. "If they hadn't flown me to Vanderbilt, I would have died. I was in there three weeks. They brought me through it. I have to watch what I do, but I'm doing great a lot better than I deserve," he said, reflecting on the incident. A man with deep country roots, he shares that all four of his grandparents were from Cannon County, hailing from the communities of Porterfield, Gassaway, Hollow Springs and Pocahontas. As for the biggest changes he's seen over the decades in Murfreesboro, he says they have to do with the traffic and people. "When I was little, this was an agricultural community," Bud said of the east side of town. "Everybody raised cattle, hogs, chickens. The traffic now looks like Nashville. Between 7:30 and 8 Sunday mornings along East Main, that's the only time you'll find Murfreesboro looking like it used to. "There's still a lot of great people, but a lot of people moved in here from different places. We still have that friendly atmosphere, but it's different. Everything used to be centered around the square. It's a different world, but still we got a lot of good people," said Bud, whose hobbies are going to the races and practicing the Golden Rule. He shares a bit of advice for younger generations. "Whatever you try to do, do the best you can, and you'll be successful. My mama said, 'You're no better than who you are.' You determine who you are. If you teach a child morals and work ethics, you can't hold them back," said Mitchell, who is living proof as well as one of the best friends folks in Cannon and Rutherford counties have ever had.